Piggy Chops' personal and professional life surely kept the paparazzi busy during the last year, as she provided quite a lot of fodder for the media! But to the disappointment of her fans, she has been in news for all the wrong reasons. Last year, after much hype & speculation, she went on record regarding her relationship with Shahid Kapur. But, soon there were talks in B-town about their split. Since then, media has been reporting on & off about their love-hate relationship. The new year too, did not begin on a good note for the 'desi girl'. In January, she again hit the headlines when the Income Tax officials raided her plush abode, and found Shahid Kapur in her house at 7am. Then came her much awaited film '7 Khoon Maaf', which despite big promises, failed to impress the audience. The only high point in Priyanka's career during the entire year was the average success of 'Anjaana Anjaani'. In the last year, there were more troughs than crests in Priyanka's life. But as she turns 29 on 18th July, 2011, the planetary positions seem to be improving. Will the year prove progressive for her? Will she come out of stressed relationships and emotional whirlpool? Ganesha finds out with the help of Vedic astrology. Priyanka will be under the influence of 'Saturn Return' till November 2011. After November 2011, Saturn will be transiting over Natal Jupiter. Transiting Rahu will be in Trine with Natal Sun, while Ketu will be in Sextile with Natal Sun. 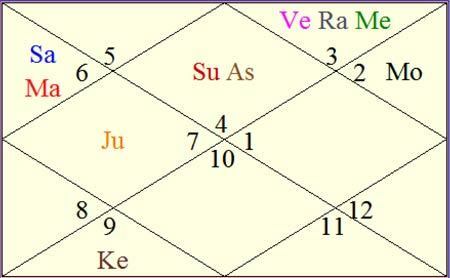 In Priyanka's Venus return chart for Bombay, Venus is placed in the 2nd House with Sun and Moon. In this Taurus Ascendant chart of Venus Return, Saturn the Yoga Karaka is placed in the 5th House (Trine from Ascendant). First quarter starting from Priyanka's birthday doesn't seem to be very encouraging for her film career but as the year progresses, the going gets good, feels Ganesha. She may earn good money during the year ahead, and may also have a scope to display better performances (as she will be coming across good roles). However, Ganesha feels that she will not look at the number of films that she is doing, instead she will now want to deviate a little from the commercial scenario to expand her horizons by doing more challenging roles. During the last quarter of 2011 and first quarter of 2012, stars are in her favour. She may remain in the limelight during the aforesaid period. She will focus more on her career and may avoid getting into controversies related to the relationships. She may also take keen interest in spirituality/philosophy or Yoga. One of her films releasing during the year ahead will do marvellous business abroad, feels Ganesha. Ganesha wishes her good luck and many happy return of the day well in advance.